What is dental decay, and what causes it? Have you heard of the word plaque? Have you ever seen one? Germs (bacteria) in our mouth grow on the teeth every day and help in the formation of plaques. Plaque is the sticky deposits that collect, in particular, around the gum line, the edges of fillings and the grooved surfaces of the teeth. If plaque is allowed to collect over time it will harden into a substance called tartar. The plaque uses the food and drink that we eat (especially sugars) to make acid. Some foods, like fizzy drinks and lollies are already acidic. 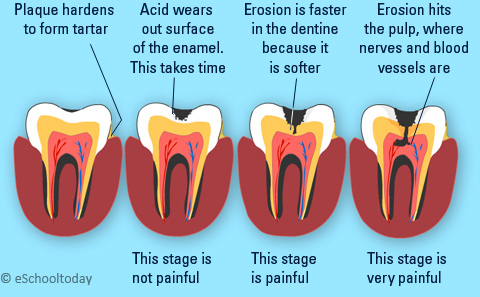 This acid attacks the tooth's outer layers (enamel and dentine) and eats them away (erosion). Over time, a small hole known as a cavity can develop on the surface of the tooth (enamel). Once cavities have formed in the enamel, the plaque and bacteria can reach the dentine. As the dentine is softer than the enamel, the process of tooth decay speeds up. Erosion is faster. Without treatment, the plaque and bacteria will then enter the pulp. At this stage, your nerves will be exposed to the bacteria, making your tooth very painful. The bacteria can also infect the tissue within the pulp, causing a dental abscess. Tooth decay typically occurs in the teeth at the back of your mouth, known as the molars and premolars. These are large flat teeth that you use to chew food. Due to their size and shape and rough surface, it is easy for small particles of food to get stuck on and in between these teeth. They are also harder to clean properly. You might need to have the tooth taken out. If it was a front tooth it would spoil your lovely smile. . Copyright © 2010-2016 eSchooltoday in association with BusinessGhana.com.